Arctic sea ice currently acts as a shield, preventing methane from entering the atmosphere, concludes a study by researchers from two Chinese scientific institutes. The researchers observed more methane in the water under the sea ice than the methane in the air above the sea ice. They conclude that the sea ice collects and holds the methane in places close enough to the surface for the methane to be consumed through photochemical and biochemical oxidation. In other words, sufficient light can reach the spots where methane assembles underneath the ice for the methane to get consumed by biological processes. Change of CH4 mixing ratio over time in the chamber on under-ice water. 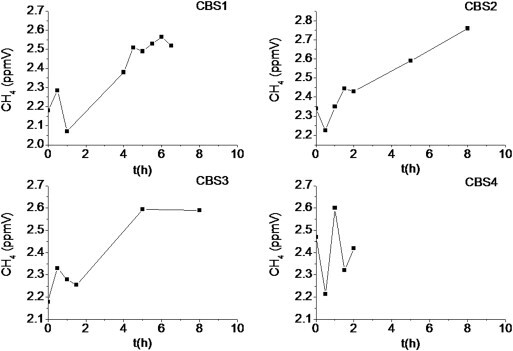 In CBS1–CBS3, CH4mixing ratios fluctuated in the first 1–2 h and then increased, suggesting significant emission of CH4. No increasing trend in CBS4 might due to the relatively short sampling time (only 2 h) during which CH4mixing ratio had not started increasing. A study by the Alfred Wegener Institute led by Marcel Nicolaus has found that where melt water collects on the ice, far more sunlight and therefore energy is able to penetrate the ice than is the case for white ice without ponds. The consequence is that the ice is absorbing more solar heat, is melting faster, and more light is available for the ecosystems in and below the ice. As the sea ice has decreased in volume over the years, there now is mainly thin, first-year ice, extensively covered with melt ponds in the summer months, where once metre-thick, multi-year ice used to be. Additionally, the melt ponds have a different color, causing further albedo change. “Their colour depends entirely on how thick the remaining ice below the melt pond is and the extent to which the dark ocean beneath can be seen through this ice. Melt ponds on thicker ice tend to be turquoise and those on thin ice dark blue to black”, explains Dr. Marcel Nicolaus, sea ice physicist and melt pond expert at the Alfred Wegener Institute. Marcel Nicolaus explains: “The young thin ice with the many melt ponds does not just permit three times as much light to pass through than older ice. It also absorbs 50 per cent more solar radiation. This conversely means that this thin ice covered by melt ponds reflects considerably fewer sun rays than the thick ice. Its reflection rate is just 37 per cent. The young ice also absorbs more solar energy, which causes more melt. The ice melts from inside out to a certain extent,” says Marcel Nicolaus. These studies contain an important warning. As the sea ice gets thinner, more sunlight and therefore energy is penetrating the ice and getting absorbed. Initially, this will increase the growth of bacteria that break down methane collecting underneath the sea ice. Eventually however, as sea ice retreats further, there will be less opportunities for methane to be held underneath the sea ice and broken down by bacteria. Instead, more methane will then enter the atmosphere unaffected. These are further feedbacks of sea ice retreat, in addition to the many feedbacks described in the Diagram of Doom. 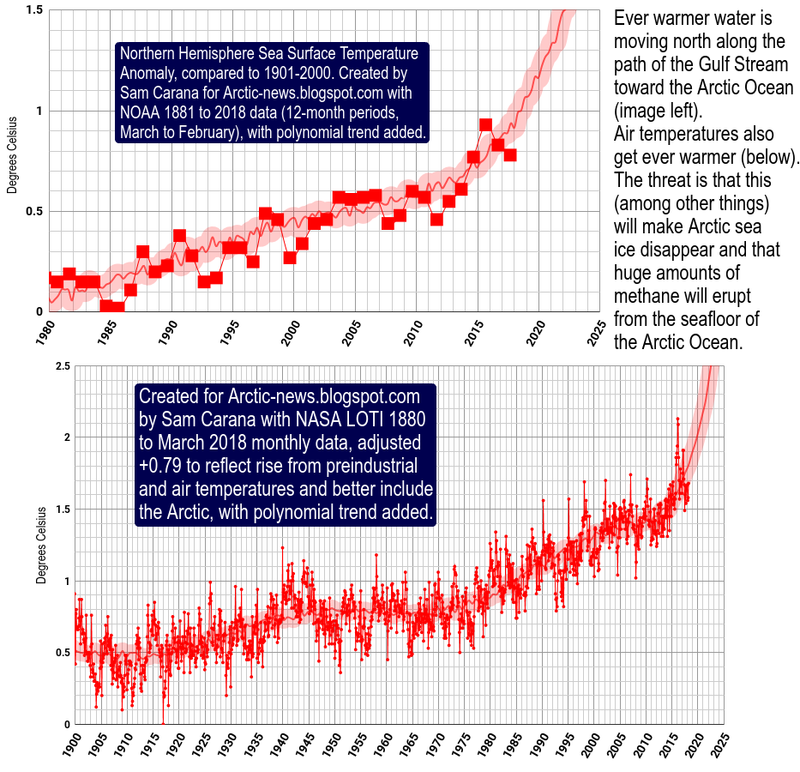 Sea ice is declining at exponential pace. 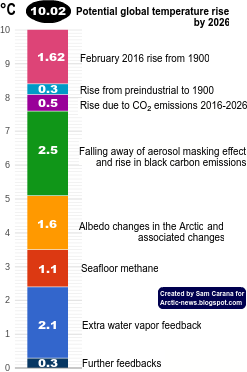 The big danger is that a huge rise of temperatures in the Arctic will destabilize huge amounts of methane currently held in the seabed. Comprehensive and effective action is needed now to avoid catastrophe. - Sea ice in the Arctic Ocean: Role of shielding and consumption of methane - Xin He et al. - President Obama, here's a climate plan! President Obama, here's a climate plan!